BestGuitarCable.com | The #1 Best Guitar Cable Reviews Site! Choosing The Best Guitar Cable! As a guitarist progresses and starts to fine tune their ear, they start to notice more and more minute details in the sound coming from their amp. While at first they might not notice the limitations of their gear, eventually every guitarist hits the point where they start thinking about upgrading. Guitarists will spend thousands on their guitars and amplifiers, but they often overlook the simple things like cables! It’s amazing what a nice guitar cable can do for the overall sound of your setup. Guitar cables can be a bit of a mystery, but fortunately this is a guide designed to walk you through the process of picking the best guitar cable to suit your needs as an electric or acoustic-electric guitarist. A guitar cable, sometimes referred to more generically as an instrument cable or 1/4″ cable, is a cable that is simply used to connect your electric or electric-acoustic guitar to your amplifier. They have two connectors; one that plugs into the amplifier jack and one the plugs into the guitar jack. The most common lengths are between ten feet and twenty five feet. This is because guitar cables of less than ten feet give the guitarist limited freedom to move around in relation to the amp, and cables of over twenty five feet start to introduce unacceptable levels of noise into the system and start attenuating various sound frequencies, which results in a sound output that is unrepresentative of the true sound of your guitar. The goal when trying to construct the best guitar cable from a sound perspective is to try to make a cable that does not alter the sound of your guitar as you play through it. In more technical terms, this means that a good cable will alter the signal as little as possible as it passes through. That means you will notice more sound detail and clarity with less graininess in the sound when using a good cable. When using a bad guitar cable, you will notice just the opposite. With a really terrible guitar cable, you may even notice buzz or hum, which is particularly unattractive and irritating. Another important attribute for any good instrument cable is reliability. At first glance, a guitar cable doesn’t seem like an item that is subject to a lot of abuse, however this couldn’t be farther from the case. Guitar cables get thrown around when on travel, sit on the floor and get stepped on, get stressed by bending past their limit and get plugged in and out. Make no mistake, they take quite a beating. So how can good reliability and accurate sound be achieved? Let’s start with reliability. The biggest consideration for guitar cable reliability is flexibility. A guitar cable gets bent, twisted, and otherwise generally abused. Materials must be chosen and the cable must be constructed such that it can bend with a pretty tight radius without resulting in excess wear on the cable. Cables must also resist abrasion well in order to avoid exposed internals. The joints that attach the wire itself to the connector must also be of high quality. In order to produce accurate sound, conductive materials must be carefully selected. Not only do these materials need to have excellent electrical properties, but also must still meet the flexibility requirements above. Cable construction also comes into play, with the most significant concern being noise elimination. 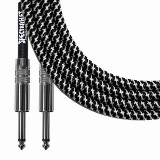 The best guitar cables employ shielding techniques that work to mitigate any noise introduced by nearby electronics from other music gear as well as cable flexing. In addition, a good cable will have excellent workmanship. It is important to keep cable length in mind when shopping around. One major thing to be aware of is the longer the cable, the more degradation in signal you will experience. Typically it is a good idea to choose a cable that is the minimum comfortable length for your setup. If you play in your room, a 10 or 15 foot cable is sufficient as you probably aren’t moving around too much. If you are gigging on stage, you might appreciate the extra room to walk around that a 25 foot cable would afford you. Additionally, if you are just linking pedals together, the best bet would be to get a 6 or 12 inch patch cable in order to keep your cables as short as possible. If you don’t know where to start, we have some recommendations. If you only play a clean guitar with no effects pedals, start with a single 15 foot cable. If you do play with effects pedals, start with as many 12 inch patch cables as you have pedals. Also, get two 15 foot cables to connect the output of your pedal board to the amp and the input of your pedal board to your guitar. This way you can distance your pedal board from your amp and then distance yourself from your pedal board so that neither your amp of pedal board limit your movement. Does Style of Music Matter? The reality is that whether you play blues, jazz, rock, folk, funk, pop, indie, or any one of the myriad of musical genres out there, the guitar cables job is to represent sound accurately by not altering the signal as it travels from the instrument to the amplifier. As such, the style of music that you play should have little bearing on what you play. A good guitar cable for one genre is going to be good for the next. Of course, there is an exception to every rule and surely there is a small handful of music players out there that like a specific cable because of the way it colors their sound. Most people however choose to use amplifiers, effects pedals, instrument choice, string choice, and electronics choice to color their sound. Although some cables are marketed for certain types of music, the reality is that a quality cable is going to perform no matter what you are playing. It should be noted that a guitar cable is not specifically intended to be limited to guitar use only, despite what the name may imply. In fact, a wide variety of electric instruments ranging from wind instruments to stringed instruments to percussion instruments use this type of cable. It is not uncommon to see guitar cables plugged into violins, organs, banjos, electric pianos, basses, or even certain types of drums. That said, even if you aren’t a guitarist, you have probably used a guitar cable at some point if you play any kind of amplified music. Additionally, other non-instrumental devices that may use this type of cable include stereos, many different studio recording devices, PA systems, headphones, speakers, microphones etc. When it comes to each of these applications, all of the above attributes that make a cable good for a guitar also apply here. While an average review is provided for all cables shown in the chart above, there are some particular cables that stand out to us as our favorites. As such, we have written a more in depth review of each of our favorite guitar cables below. 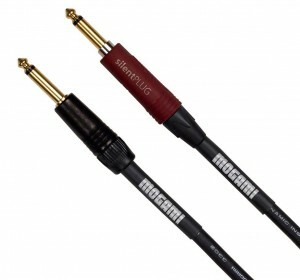 The folks at Mogami really know what they’re doing when it comes to high end music cables. These guys are the bees knees so to speak, and their price reflects that. 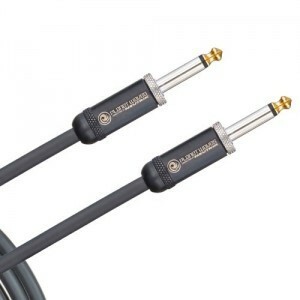 The Mogami Gold is one step below their top of the line Platinum, but we feel that this cable represents a much higher value than the Platinum line and is more affordable to the enthusiast and offers almost the same performance. The Gold line has stranded copper for the core, a conductive polymer subshield surrounded by a high density copper shield. Varying strain relief techniques were employed to make the cable flexible which in turn makes it durable. The cable provides fantastic clarity and detail throughout the range, with particularly excellent highs and midrange. It can be had with a 90 degree right angle connector on one end if you wish, which can be a plus depending on your amp configuration. It can also be had with two straight connectors. Due to the price point, this cable is mostly suited for the pros as the average enthusiast can probably get by with other cables. 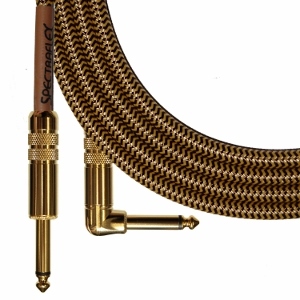 If you are an enthusiast who has to have the best and is willing to spend the coin, the Mogami Gold line is a great bet and certainly won’t steer you wrong. An added perk when purchasing a Mogami cable is that Mogami has a strong lifetime warranty that is more or less no questions asked so you have peace of mind that you won’t have to spend the money again should your cable eventually start to show wear. When it comes to looks, Spectraflex takes the cake. When it comes to fashion, they say it’s the little things that count. In this case, the nylon covered braid really sets these cables off and gives them the retro look. In addition, the braid can be had in a variety of patterns such as Python, Rope or Zipper in either brown or gold. But who cares about looks if the cable doesn’t perform? Fear not, because this is not the case with the Spectraflex Vintage Series. 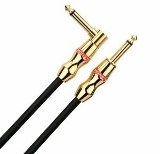 Gold plated connectors as well as great shielding make this cable extremely adept at transferring an accurate signal across the entire range. Additionally, the cable is not too stiff so it can take some abuse with will lay comfortable on the ground when in use instead of kinking or tangling. 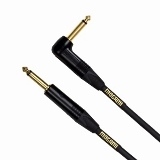 Overall, this cable is about half the cost of the Mogami Gold above, and offers a better value overall. This one really has the complete package when it comes to looks, sound and price. At the end of the day you can’t go wrong with this one and it’ll look sweet plugged into your vintage Tele or Strat(or whatever other vintage axe you may play). 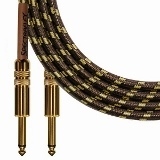 The Planet Waves American Stage represents the value buy of the cables we recommend. 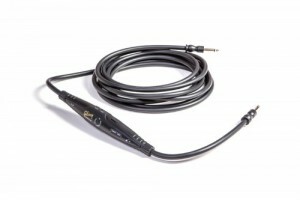 It is less expensive than the previous two cables, but still provides great sound characteristics. It contains an oxygen-free copper core wire with a tinned copper braided shield. Planet Waves uses a specifically shaped plug to improve fit in all audio jacks. This cable may not look particularly special, but it is certainly functional. It will not color your sound, offers good durability, and does the job when all is said and done. It offers a lifetime warranty and comes in at a very reasonable price point. Overall, this cable provides a higher value than the previous two, but won’t offer quite the same sonic performance. 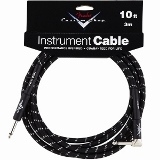 Even still, this is still a great cable and will make all but the most picky guitarists happy. So now you have the basic foundation of knowledge required to select the best guitar cable to suit your needs. You have seen a number of excellent options as well, so it should make choosing a good one easy! Do keep in mind that there are many great cables out there, and the list above is simply a sampling of our favorites. Also realize that sound is subjective to some degree, and that it is highly possible that you will get to try many guitar cables over the course of your music career. As such, feel free to explore other options available by clicking here to make sure you get the perfect cable!